In the competitive world of fine dining, commissioning the creation of custom objects for food presentation has become practically de rigueur. 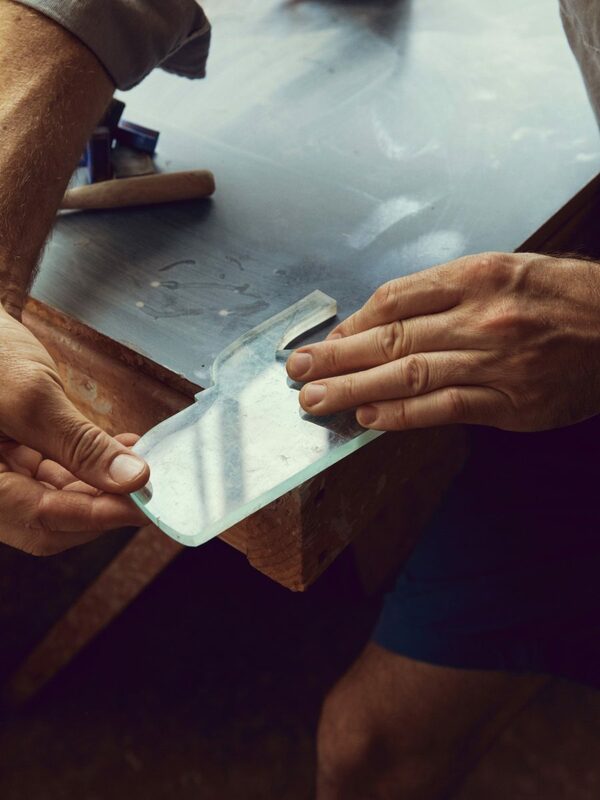 We talk to two of the industry’s most sought-after serviceware designers — Jono Pandolfi and Martin Kastner — and discover that the careers, work, and creative processes built around their art can be as complex and varied as the food that is served on it. 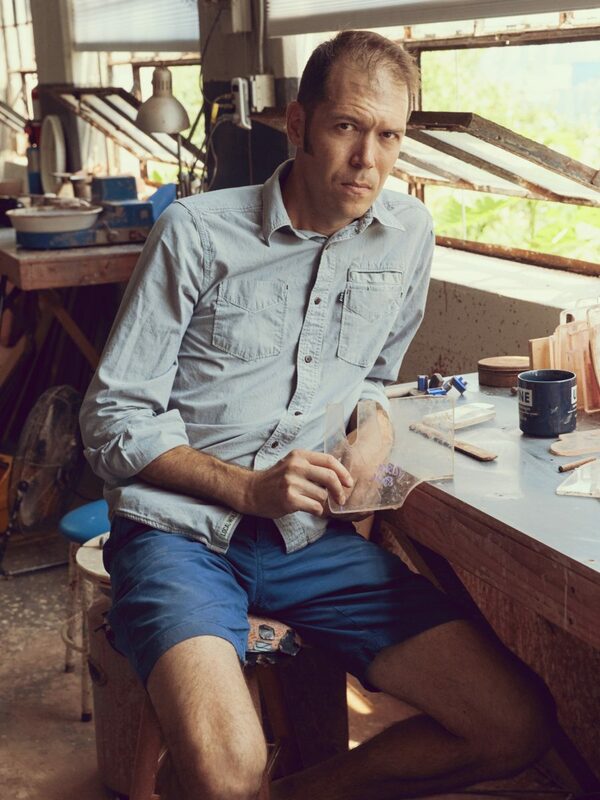 Jono Pandolfi puts down his coffee cup, a clear plastic tumbler with a faded Batman logo, and studies the pressed sheet of clay, whose surface has been carved up by knife into identical circles, on the table in front of him. 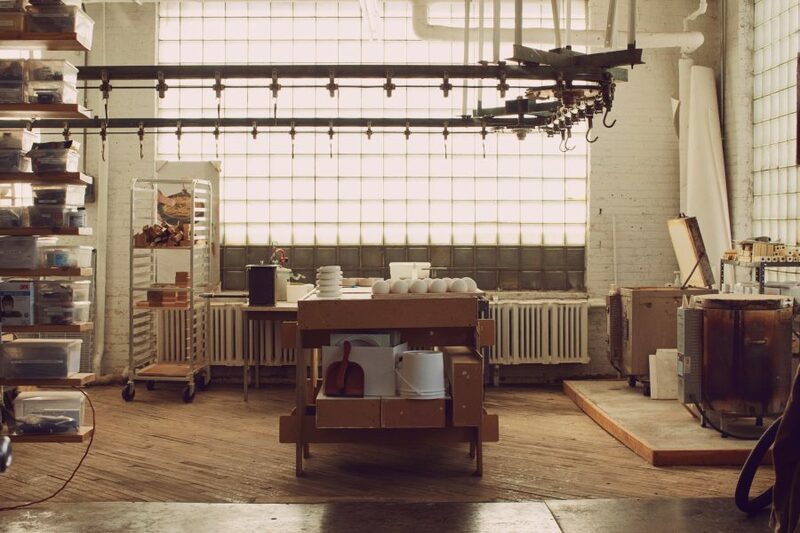 Here in his studio, a 4,250 square foot space in a 100-year-old, rusting, former soap factory overlooking the Hudson in Union City, New Jersey, Pandolfi makes his signature stoneware ceramics for his restaurant clients. 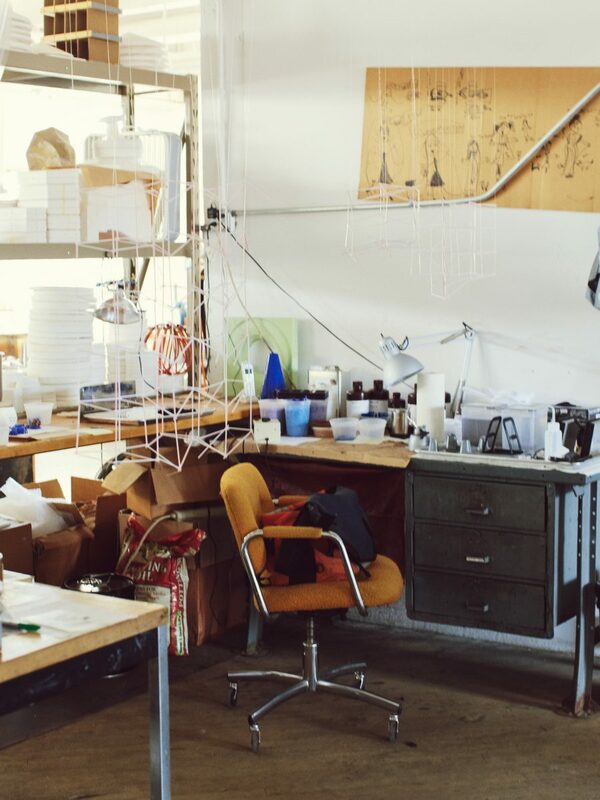 The studio takes “open concept” to its logical extreme – moving counter-clockwise from the door, it operates as waiting room, product archive, office, meeting room, clay mixing, rolling, shaping, glazing, and resting areas, outlet store, kiln room, customer fulfillment center, kitchen, and dining room. The bathrooms, mercifully, are down the hall. His Boston terrier Pen explores the room while his team diligently works. 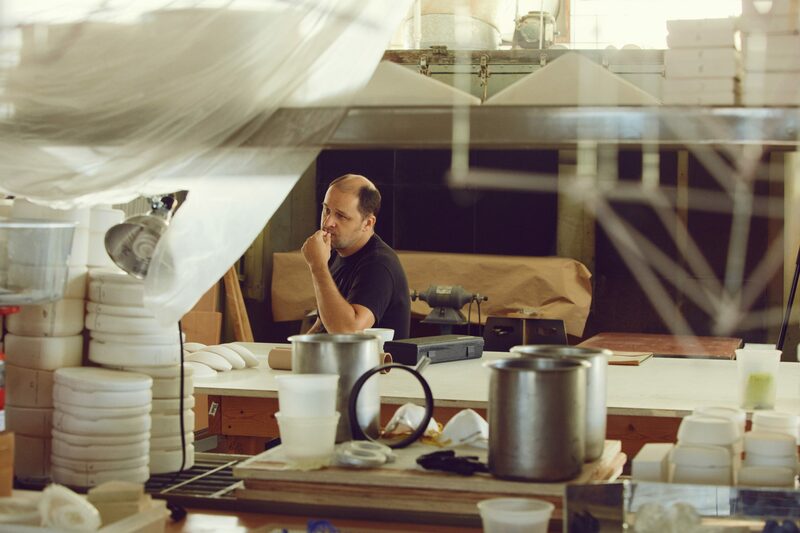 Pandolfi, who is tall, wiry, and intense, is usually buzzing around the room tirelessly, adjusting equipment, glazing product, fixing kilns, checking orders. 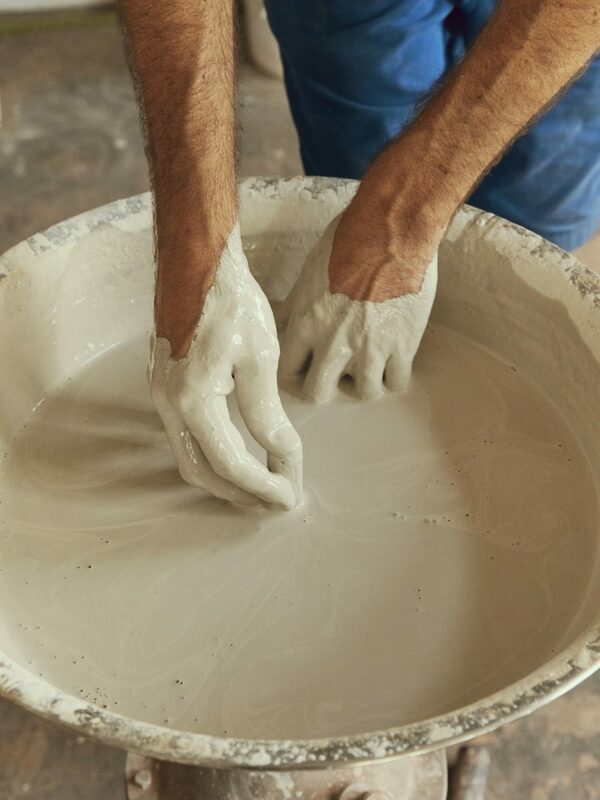 But right now he wants to show me one of the core innovations that he believes makes his ceramics practice special, a problem he solved to fulfill an order from New York’s Eleven Madison Park, who is now his signature client. The Jono Pandolfi USA Studio. Pandolfi pulls and separates one of the heavy, inch thick discs out of the clay. 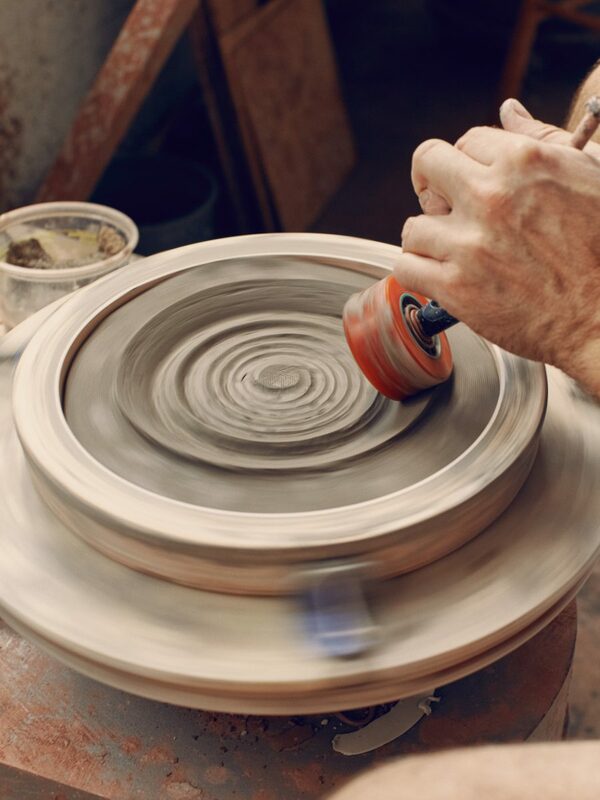 He quickly studies its shape as he turns and plops it down neatly into a circular mold on his potter’s wheel. After smacking the clay loudly to make sure it’s evenly flush, he pumps the pedal below. The wheel starts to smoothly and silently spin, and he presses a tool into the soft surface and pulls it out radially from the center. The clay quietly erodes and evolves. Next comes the innovation in question – the jigger, a shaping tool potters use to make flatware. Pandolfi’s is modified to work opposite from a typical one. This makes intuitive sense. Why focus so heavily on the side of the dish the food never touches and the diner never sees? With a wet sponge in one hand, he lowers the jigger’s mechanical arm until the fiberglass blade makes contact. 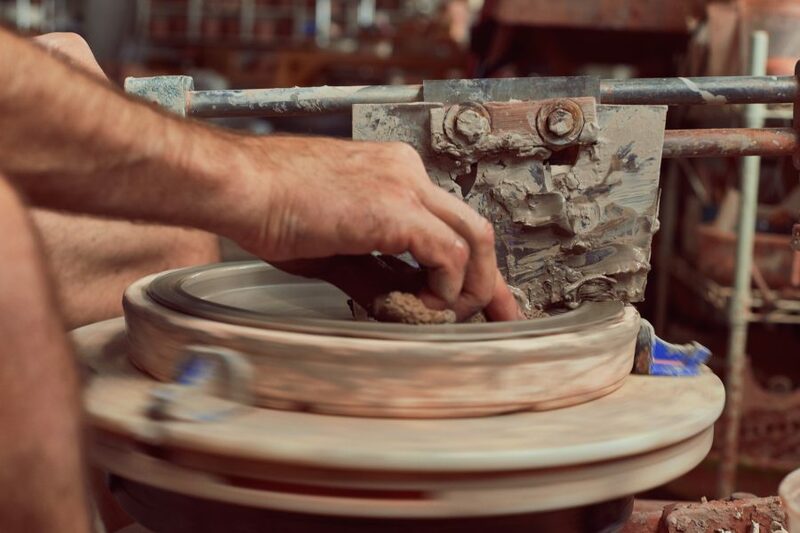 Clay flicks and peels off the surface like wooden pencil shavings as the jigger quietly carves rimmed walls into the spinning disc. Suddenly, magically, you’re staring at a plate. A portrait of Jono Pandolfi. 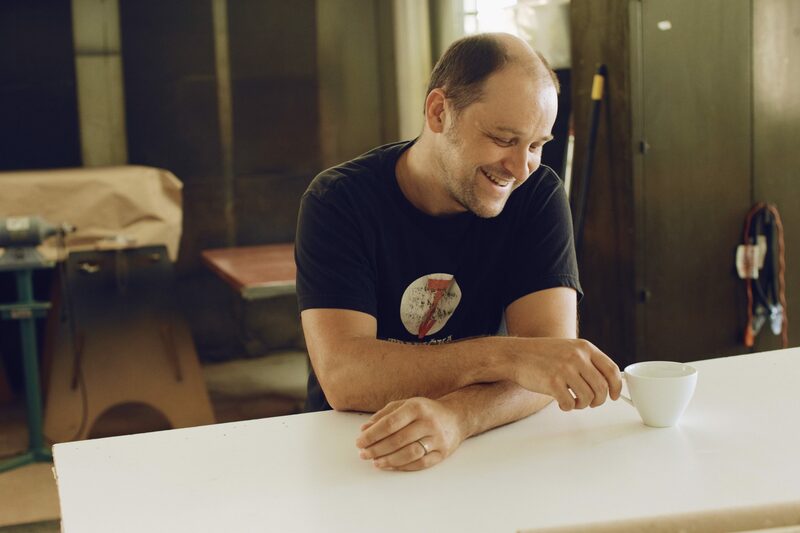 Eight hundred miles away in western Chicago, Czech-born design-polymath Martin Kastner is brewing coffee in his design studio’s kitchen. He explains that he’s been pondering a coffee-making process that better balances quality, cost, and efficiency. It’s one of his “pet projects” – work he tackles purely out of intellectual interest – but he can’t seem to find the time to get it done. Kastner’s other activities are his main work – designing beautiful, curious contraptions that rethink the conventions of fine dining. He is best known for his decade-long collaboration making service hardware and other objects for Chicago’s Alinea, the flagship property of avant garde chef Grant Achatz. At the time of our visit, Kastner was busy helping Team USA prepare for the 2017 Bocuse D’Or, a sort of biennial, culinary Olympics. He’s been a revelation for the team: when he designed the team’s service objects for the 2015 competition, they placed second, making the podium for the first time; at the 2017 competition in January, they took first place. A portrait of Martin Kastner. 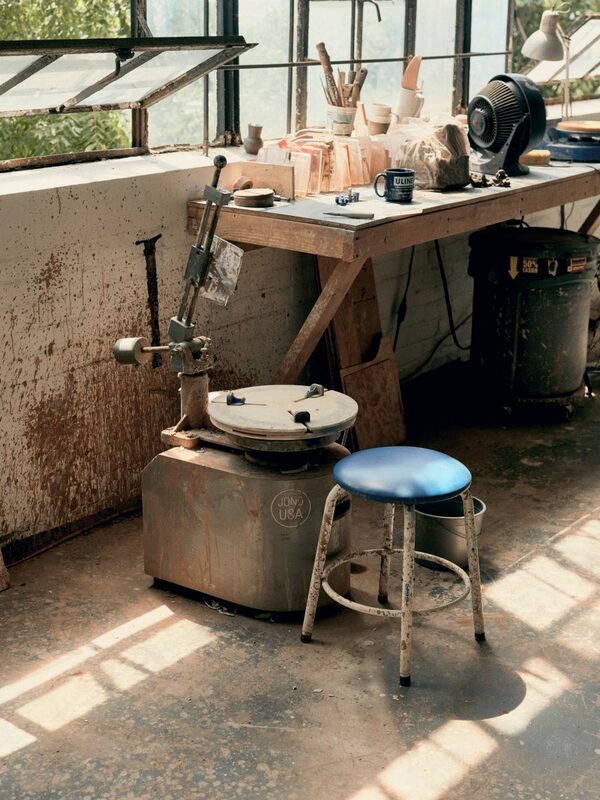 Like Pandolfi, Kastner operates his Crucial Detail studio in a disused industrial building, in his case a bicycle factory. 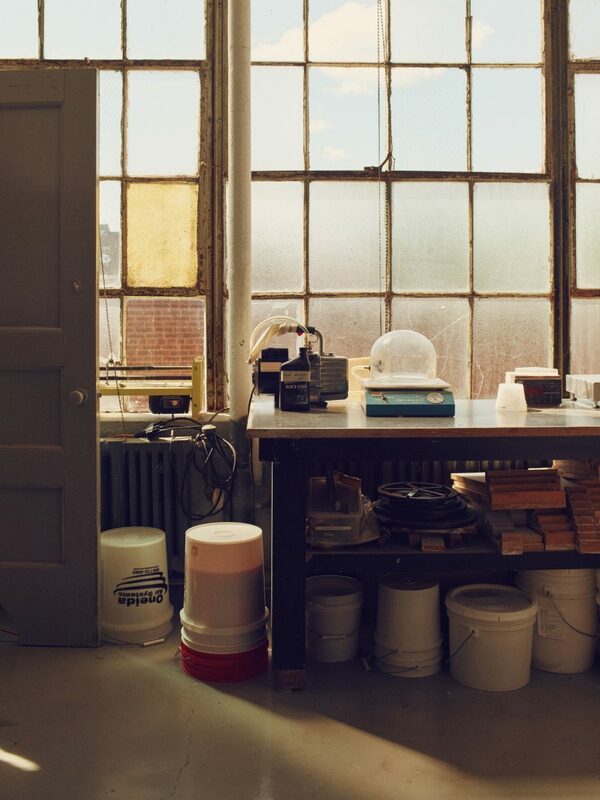 Its aesthetic is a mix between gritty industrial museum and lighthearted laboratory. 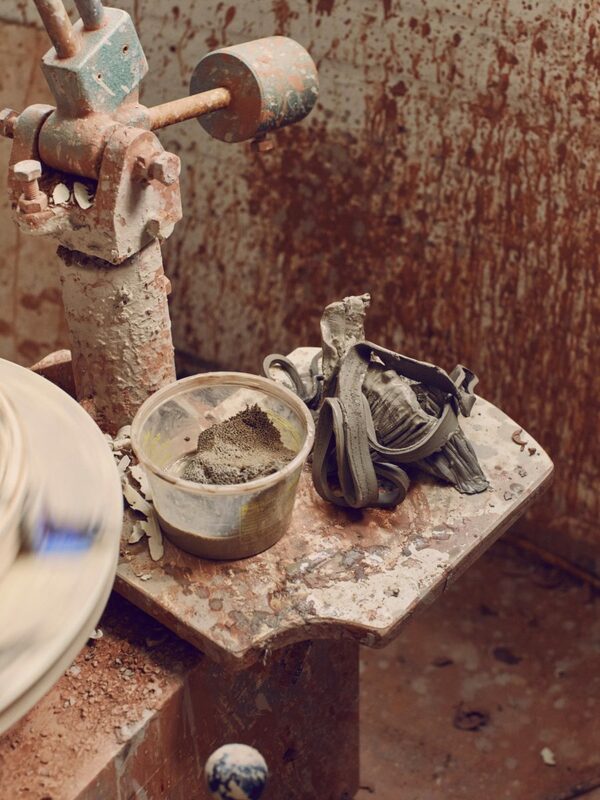 A still-functioning, mechanical paint line of hanging hooks runs throughout. 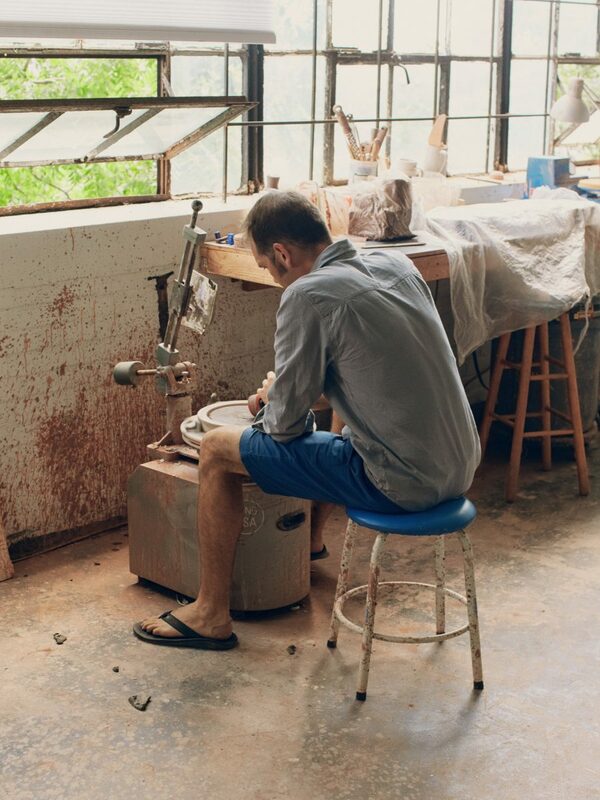 Between the spray booth at the end of that line and a pair of ceramics kilns is a modified pressure pot that he describes as, “my $50 version of a $50,000 casting machine.” He modeled it after an improvised process he saw in Thailand. Across the room there is a smart oven that he uses for glasswork, metal, casting, material burnout, cooking meat, and baking bread. 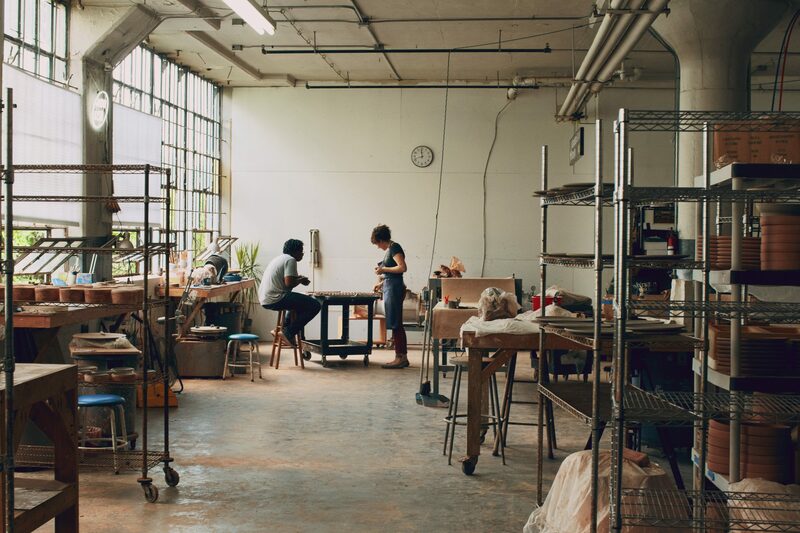 When he describes one room as being filled with “stuff everybody has in their garage,” the contents make you concerned about whose garages Kastner has been visiting: table saw, downdraft table, lathe, CNC machine, wax injector. 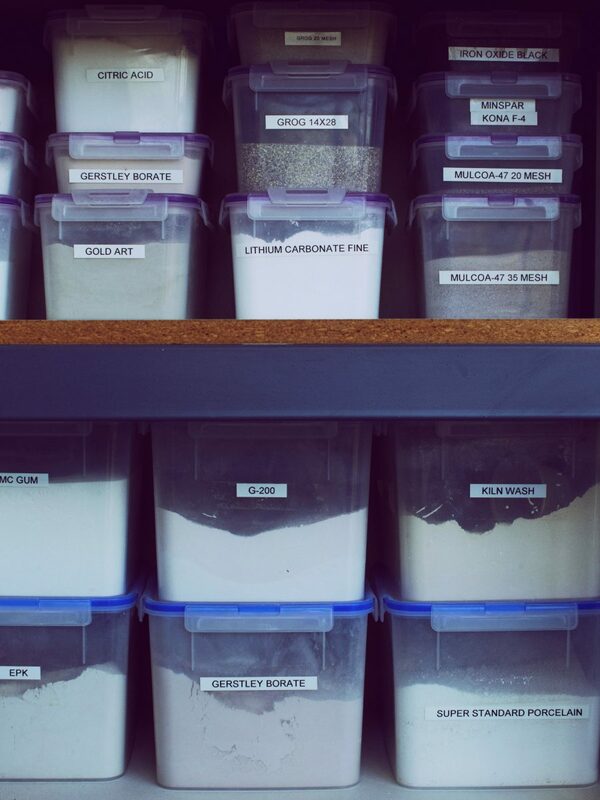 Another room, the wet room, is nicknamed “the pantry.” Along with a vintage vacuum chamber for de-aerating rubber, it is lined with buckets of minerals and chemicals like silica powder and bone powder to mix manufacturing materials from scratch. He isn’t the sole tenant. Kastner’s wife Lara operates her photography studio here, and their two young children often make it their fantastical playhouse. “All this is kind of their enchanted forest.” They trace themselves on life-size coloring books and have “finger-painting raves”; they ride around hanging from the paint-line hooks; they build cities from the resin byproduct of his stereolithography 3-D printer. Kastner has a knack for wringing conceptual and abstract questions from his surroundings, and he has a surplus of ideas. “I put obstacles in my way on purpose so that I would not forget about them.” An old thesis project of wire and drinking straws that simulates the behavior of air in a room hangs from the ceiling in the middle of his office. Rough sketches and notes cover his “Do Not Forget Me Wall”, which he asks us not to photograph too closely. The information is proprietary, but Kastner also doesn’t like communicating in sketches and renderings. For restaurants at the highest end, the kind that operate in the peculiar air of the culinary exosphere where avant garde meals last hours and cost hundreds of dollars per head, meeting the expectations of their reputations and price tags demands a lot: constant innovation and reinvention, service wound to Swiss-watch precision, convention-thwarting thrills. It is food and drink in the form of a personal, four-hour magic show. Such bravado not only demands an illusion, but also someone to design and create the hat the rabbit is pulled out of. 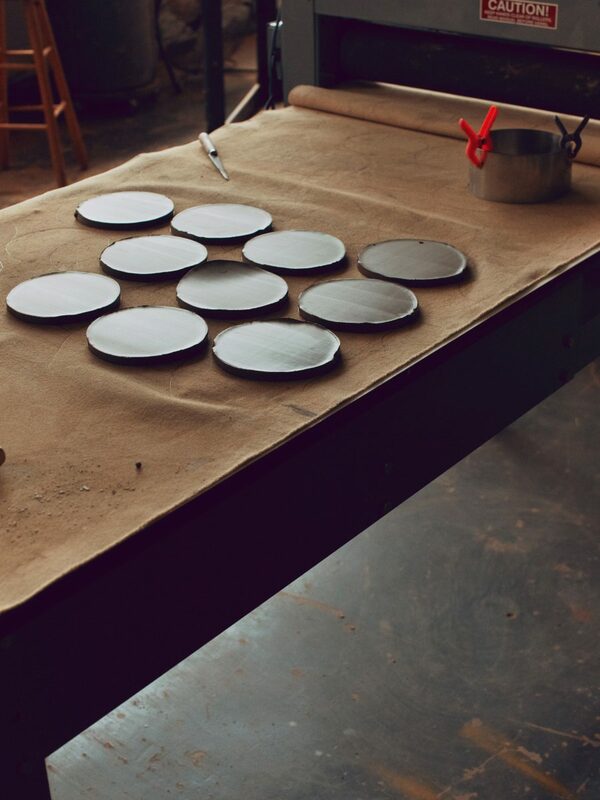 The industry has increasingly turned away from traditional dinnerware providers in favor of bespoke solutions. “Fancy restaurants used to be French restaurants. Those restaurants aren’t really around anymore,” notes food journalist Howie Kahn. Pandolfi and Kastner’s most esteemed clients, Eleven Madison Park and Alinea, aren’t just really good restaurants; they might be the two best and most important in America. If your food doesn’t match the plating — if the plating is better than your food — then you’re ridiculous. Their critical bona fides, at least, would agree: along with Eric Ripert’s Le Bernardin, they are the only American restaurants with the distinction of holding both three Michelin stars and a ranking in the World’s 50 Best Restaurants list every year this decade. For six of the past seven years, one of the two has been the highest-ranked American restaurant on the list. At times the two, diamond members of a daring generation of restaurants birthed from El Bulli’s gastronomic contrails, can seem cosmically linked. Both are owned by famous pairings of pedigreed chef and enterprising restaurateur – Humm and Guidara at Eleven Madison; Grant Achatz and Nick Kokonas at Alinea. In 2012, the two restaurants traded kitchens for a week. Last year, Alinea underwent dramatic renovations; this year, Eleven Madison Park will do the same. Both have expanded into other lines of business – Humm and Guidara’s Make It Nice Group has moved into hospitality and fast casual; Achatz and Kokonas own three other highly regarded restaurants and an online reservation system (Eleven Madison Park uses it). 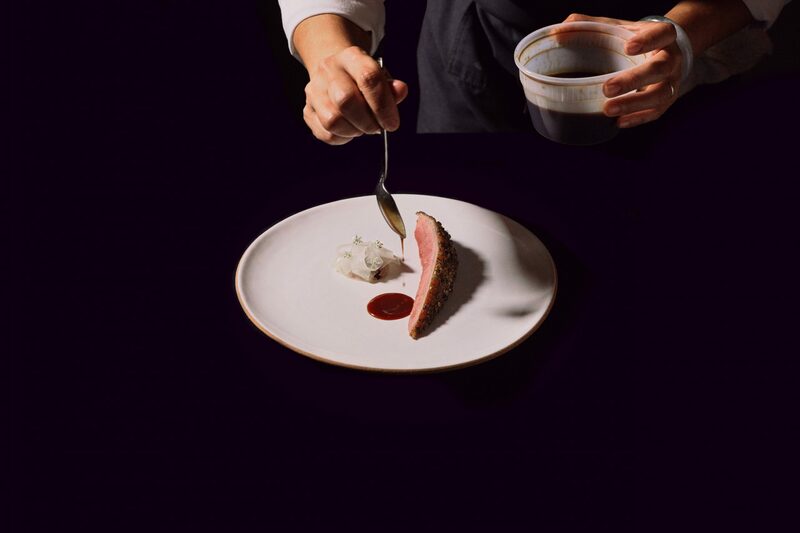 But they are decidedly different experiences – while Eleven Madison Park more ambiguously straddles modern and traditional notions of heightened, personalized service and fine-dining, Alinea traffics in food as a form of expectation-defying, mind-blowing future theater. And this contrast, unsurprisingly, extends to the breed of collaborator each has in Pandolfi and Kastner. Pandolfi, who was first drawn to ceramics as a teen because of its “primal” permanence, approaches his work with an austere practicality. 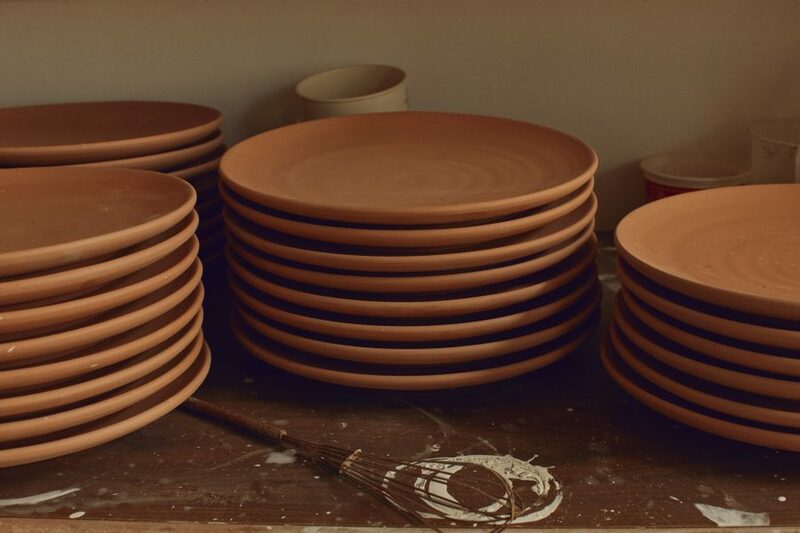 His stoneware is rough and durable, minimalist and versatile. 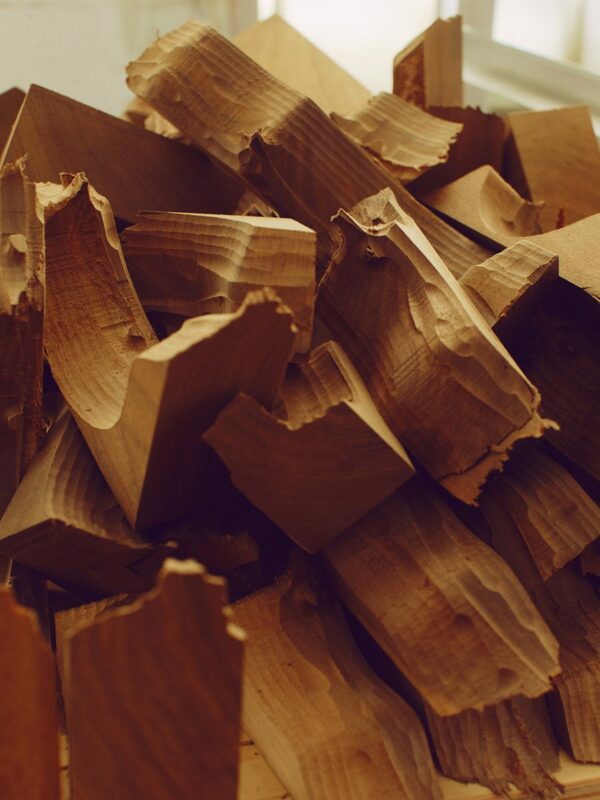 Its handmade imperfections make each piece feel meaningful and timeless. Kastner, too, was initially drawn to old, traditional arts because of a fascination with their seeming permanence. In a rather bizarre anachronism, the man tasked with creating the modernist objects to match Achatz’s modernist food first trained as a blacksmith, restoring metal works in a Czech castle in thousand year-old Prague. 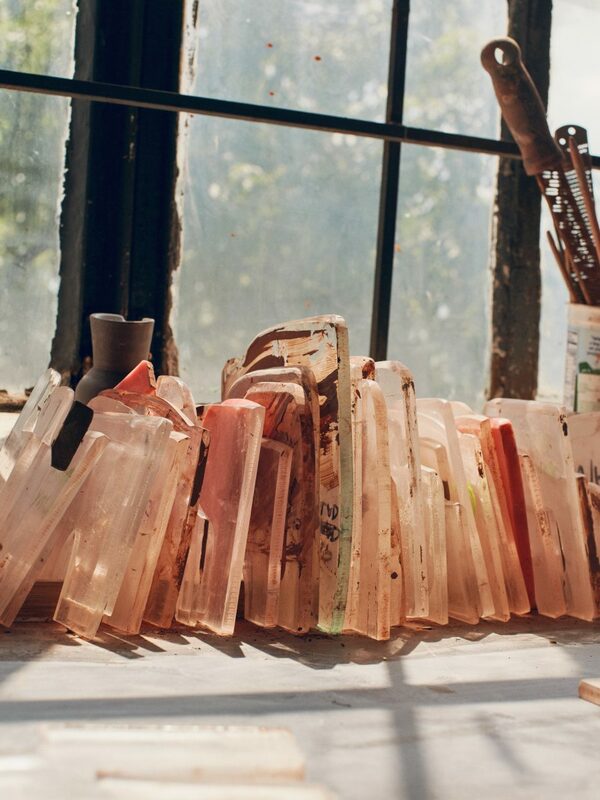 In graduate school, he studied weaving, papermaking, and carving. 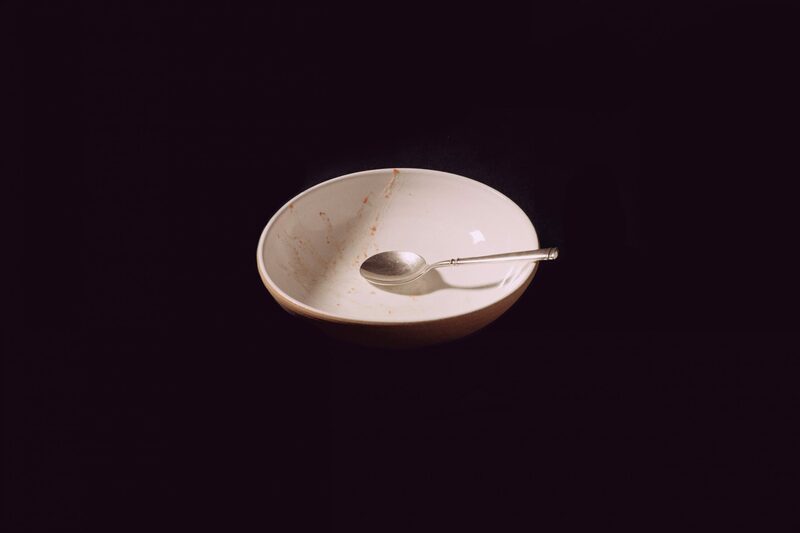 Two events shifted Kastner’s belief in the permanence of objects. First was the reality-altering 1989 Velvet Revolution in Czechoslovakia during the collapse of the USSR. Second was moving to the United States ten years later with his American wife and witnessing the difference in how Americans and Europeans treat objects. His approach to design is thus at once abstract and specific, and necessarily one-off. Kastner interrogates a function and finds a form that intuitively and purely serves that function, free from the constraints of preconceived notion or tradition. How can hot and cold be served together (Cold Potato, Hot Potato )? How can time change a cocktail’s flavor (the Porthole infuser)? How can you uniformly expose a delicate piece of food to air (Squid)? What Jono is making is not his aesthetic. His aesthetic is to have an unbelievable ability to create and collaborate. 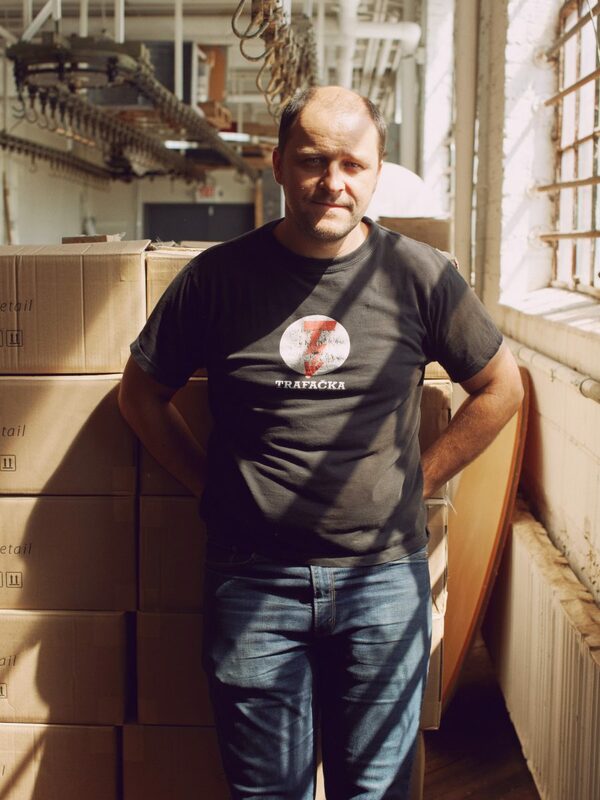 Part of the reason Guidara knew he could trust Pandolfi was because of how long they’ve known each other – they met in Guidara’s high school ska band, Hydrant. “I went to high school with him. He was classmates with my younger brother, so I knew him sort of through my brother,” Pandolfi says. “And then one summer I was home from college. Will’s band needed a bass player. I was good friends with the singer; I got the call. I played bass with them for the summer. That’s when I kind of got tight with Will.” The two remain close – the week before we spoke, Pandolfi put on a Ghost-themed pottery-throwing seminar at Guidara’s summer camp-themed wedding to Momofuku and Milk Bar’s Christina Tosi. After college, Guidara started his hospitality career managing the cafes at the Museum of Modern Art. Pandolfi, working at the time as a home furnishings designer, offered to make a set of 40 bud vases for MoMA for free. That led to a set of chocolate boxes, and a disastrous standing chopstick set (“it actually violated every law of what you never do with chopsticks,” Guidara). 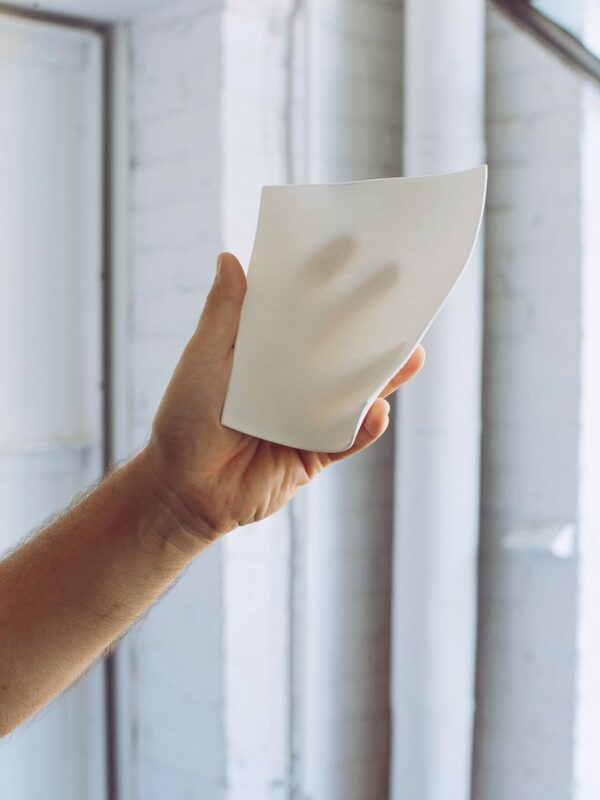 When Guidara started running Eleven Madison Park, Jono designed a porcelain plate in the shape of a pillow that impressed Chef Humm. 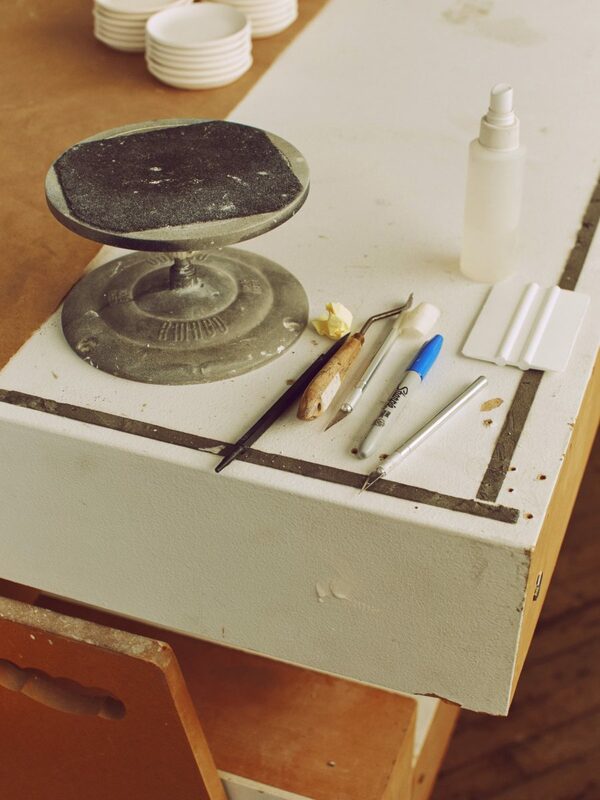 Eventually, Pandolfi would win a contract in 2011 to do all of the dinnerware for the duo’s newest venture – the NoMad Hotel. The 7,000 piece order was so large Pandolfi had to outsource the production to a factory in Ohio. Pandolfi and his wife Erica had just had their first child. 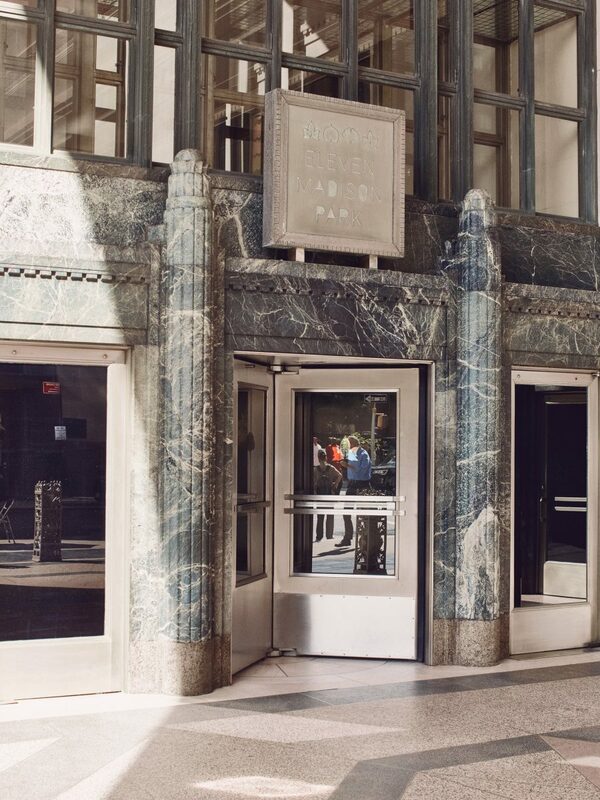 The entrance to Eleven Madison Park. One of Jono Pandolfi’s jigger templates. 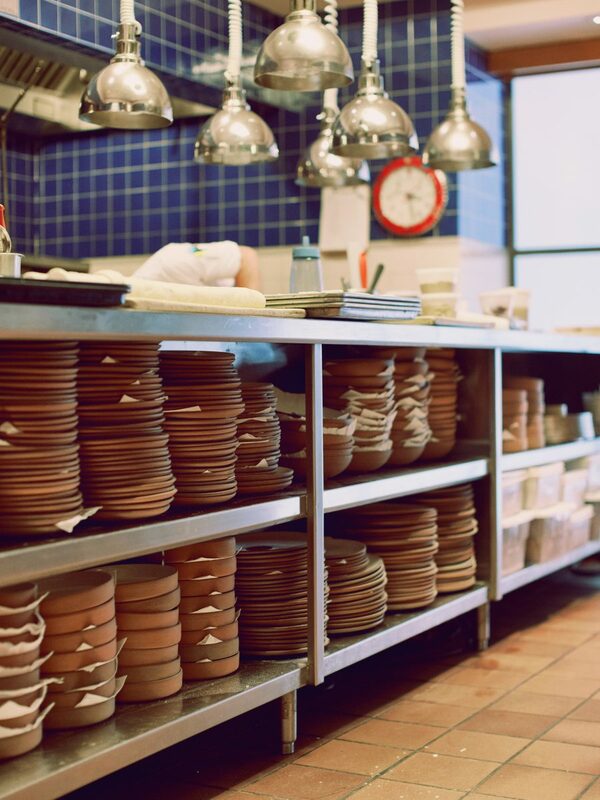 One of the kitchens at Eleven Madison Park, filled with Pandolfi’s plates. But the work got done, and Guidara, Humm, and their team loved the product. They wanted more. While Pandolfi will sell to anyone, his client list is filled with buzzy, critically-acclaimed fine dining establishments from across the country. At last count, they collectively boast 13 Michelin stars. Grant Achatz found Martin Kastner in a similar bit of era-specific blind luck like Guidara and Pandolfi’s ska band meet-cute: by finding his homepage on Yahoo. “When I came to the States … I could not afford any conventional marketing methods and the internet was starting. So I learned how to design a website and made a website for myself. Because there was not a ton of it yet I was scoring pretty high on search engines,” he recounts. “I got a random email from him that says, ‘I’m a chef looking for somebody to design new ways of serving food’ and without any conditions and that was really fascinating to me.” Kastner had just relocated to California from the Midwest with his wife, but he started a long distance correspondence with Achatz. They immediately were natural foils for each other intellectually and creatively. For Achatz, Kastner’s unconventional background and way of thinking was pitch-perfect for finding answers to the sorts of questions he wanted to ask. 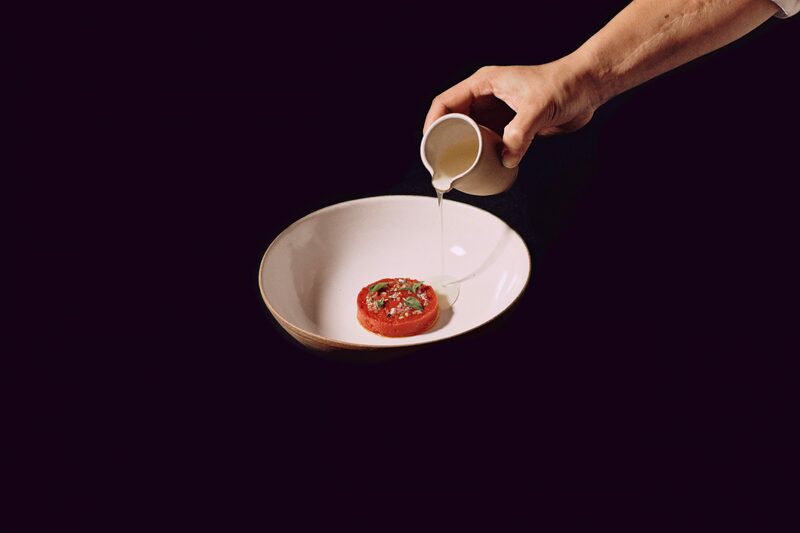 For Kastner, who had recently become interested in food as a design material after his wife worked part-time in a bakery, Achatz provided the technical culinary skill and vocabulary he lacked. Their partnership started with small projects while Achatz was executive chef at Trio in Evanston, Illinois. During this time, Kastner’s gift for challenging the conventions of objects became his signature. 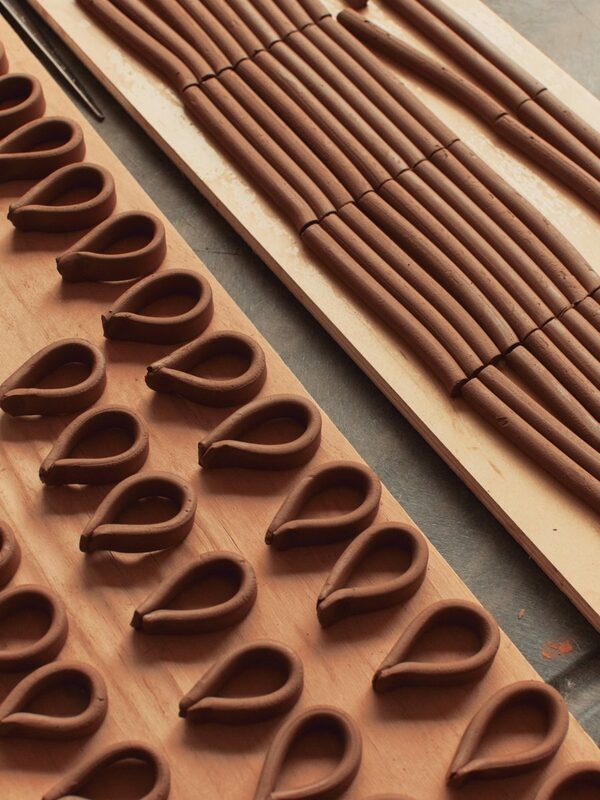 When Achatz asked him to make a lollipop stand, Kastner answered with a riddle: “Why make a lollipop stand when you can make the lollipop stand?” He delivered individual, collapsible lollipop tripods. It wasn’t always smooth. Early on, he told Achatz the menus used at Trio didn’t make any sense. “I think I offended him…I wasn’t diplomatic. I was just puzzled by it … But then he called me back and he’s like, ‘well what did you mean with that?’” The ensuing conversation eventually resulted in Alinea’s famous infographic menu. Like any great collaboration it’s tough to tell where things began or ended on any project or who contributed exactly. Later, when working on a presentation the Trio team would give at a culinary conference in Spain, Kastner criticized the quality of the food photography and asked his wife, Lara, to reshoot them. 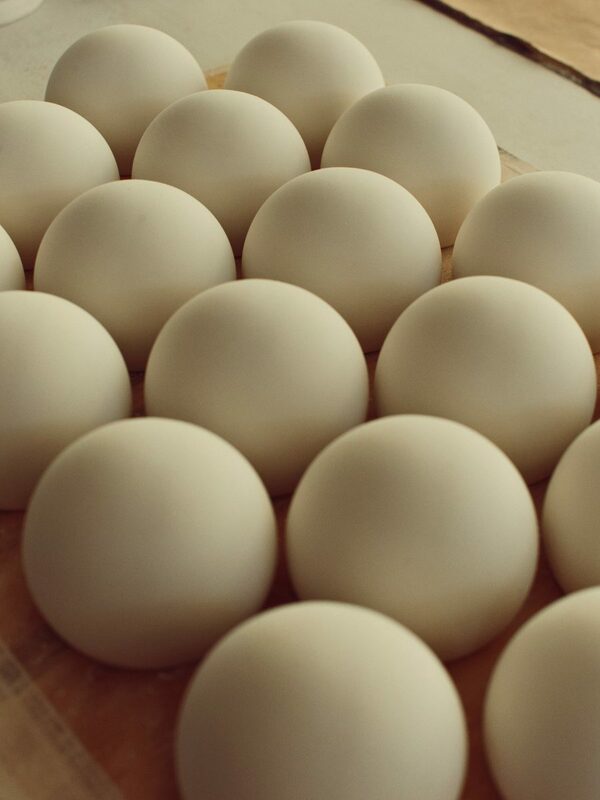 “They came back and were like, ‘we’ve never seen food photography like this. Would you be interested in actually documenting our food?” The couple would later spend two years creating the 416 page Alinea book. Kastner went on to work on other properties of Achatz and Kokonas with the shape-shifting restaurant NEXT and the experimental cocktail bar The Aviary. 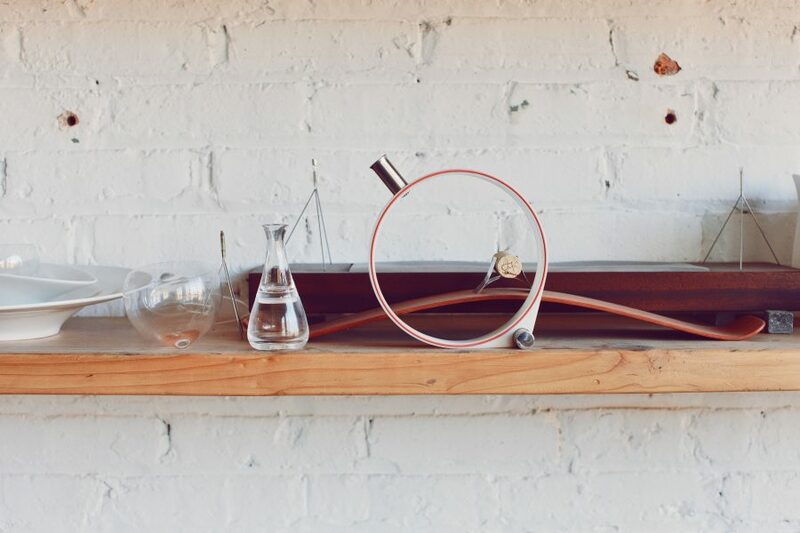 The Porthole cocktail infuser he designed for The Aviary in 2011 is perhaps his most recognizable work. An infusing and serving device in the form of a submarine window, the device has inspired inventive uses, shameless knockoffs, and a Kickstarter campaign for mass production that raised three-quarters of a million dollars. It continues to be a top-seller on the Crucial Detail website, where it sells alongside a greatest hits collection of Kastner’s creations. But over time, after they had hit the conceptual “low hanging fruit” and Achatz and Kastner’s schedules became busier and their teams grew, they naturally worked less with each other. Last year’s reimagining of Alinea was an opportunity for both sides to step away and “make an intentional break from the original concept after 10 years”, in the words of Kokonas. Today, Kastner is slowly turning his attention to the broader world. 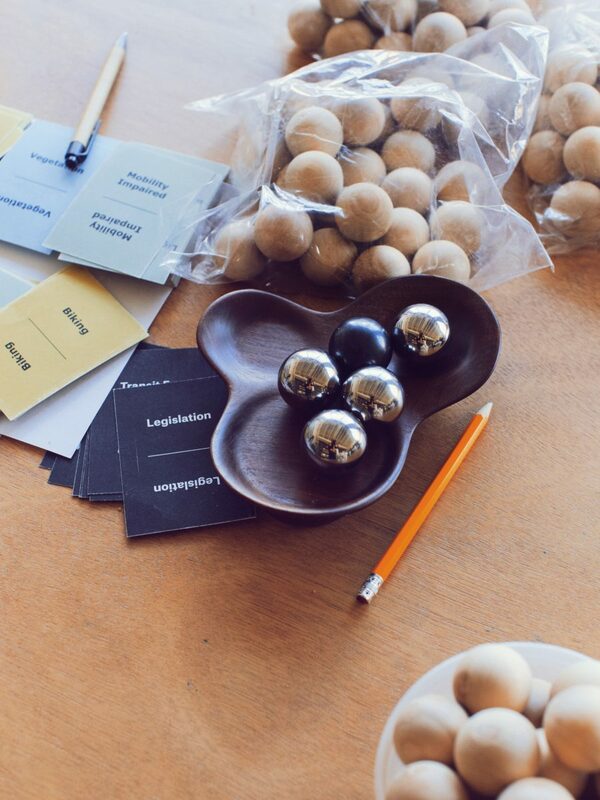 For example, he was recently commissioned by the Illinois Institute of Technology to create the “The Driverless Car Scenario Builder,” a simple, interactive device meant to stimulate discussion of the future of urban living spaces. It’s good Pandolfi finds pleasure in the pure productivity of his business, because there is rarely time to come up for air. The firing volume of his five kilns is inadequate to meet demand; he hopes to double it and promises a major development is coming soon. 95% of their production is done on site; he hopes to introduce more outsourcing capability soon as well. 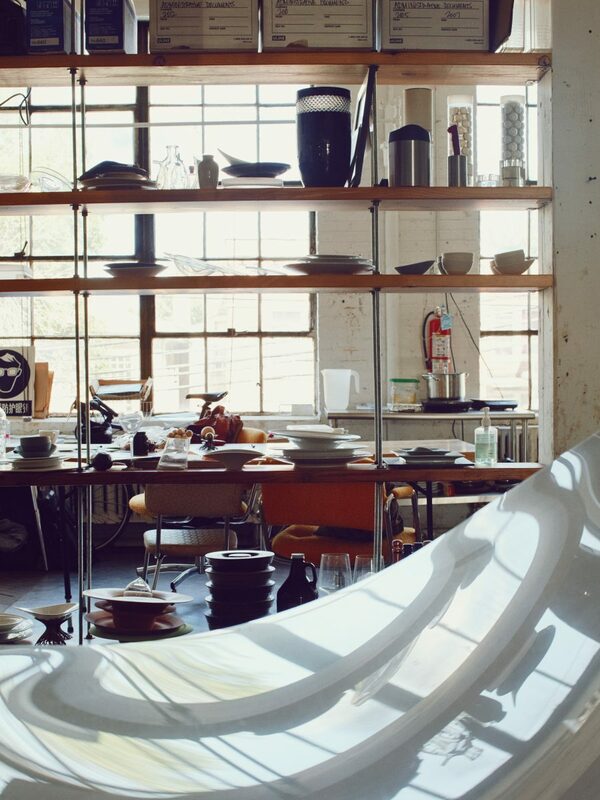 And Pandolfi hopes to expand his design business beyond ceramics. He’s wanted to create a lighting collection for two years, and he’s starting by doing the lighting for Made Nice, Humm and Guidara’s fast-casual restaurant. Eventually, he’d like to get back into jewelry design, something he did in his early days in New York. He hopes that journey will, in a way, lead him back to where he started.